Students Eli Stillman and Hannah Jones, then administrators Alena Ruggiero and Greg Jones discuss The Siskiyou. The tribulations of the journalism business are well documented, and affect outlets big and small. 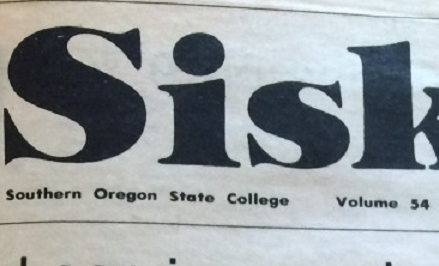 The student newspaper The Siskiyou at Southern Oregon University already gave up its print version several years ago. Now its staffers and faculty guide are trying to save it from extinction as an online-only publication. SOU is pulling its official support, but leaving the door open for a student-funded Siskiyou; a gofundme campaign has been set up for stopgap support. Editor Eli Stillman and writer Hannah Jones, then SOU administrators Greg Jones and Alena Ruggiero visit the studio with an update and a look ahead. SOU's position: only seven students need to sign up for the paper to continue as a club. Eli Stillman and Eric Ghelfi lay out the issues with their paper. It's a tough business climate for journalism. How do you get people to buy the information you offer when they can get so much online, for free? The situation affects journalists-in-training, too, like at the Southern Oregon University online publication "The Siskiyou." It ceased printing a paper version several years ago, and now faces additional pressures to deliver or face downgrades.